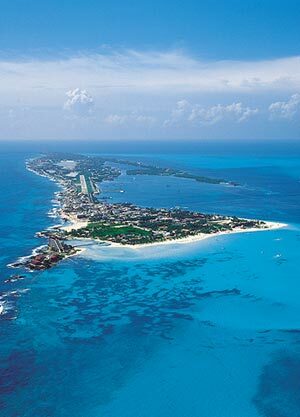 Just 11 kilometers from Cancun is found an amazing island destined for tranquility and rest. Its tropical palm trees lining the island, smooth white beaches and peaceful atmosphere make Isla Mujeres an area preferred by locals and tourists alike. With clear, calm, crystalline waters one can only admire the beauty of the Mexican Caribbean at their feet. Different archeological zones are protected on Isla Mujeres; one of these is dedicated to Ixchel, Mayan goddess of love and fertility, and offers impressive views that simply must be enjoyed. For lovers of the deep ocean, there are reefs such as El Farito, Punta Norte y Manchones, in addition to the Cave of the Sleeping Sharks; places that offer all professional divers an incredible experience. Smooth tropical breezes and sunsets unlike any other in the world can be appreciated here, complementing its natural appeal and making Isla Mujeres another must-see place in Quintana Roo for all of its visitors.